Unique is the connection of the FEWO to our "naturopathic practice". We are happy to advise you and take a lot of time for you. With us you also get in the apartment vegetarian breakfast for free for 2 people. From the 3rd Person child od. Adult we ask a cost contribution of 4, - Euro per person. Overnight for breakfast. On the pictures you can see what your breakfast includes. In the morning you get hung up at 6:15 fresh bread on your apartment door. 1 fresh egg per day is also available free of charge from our chickens. Please note that the entire apartment is a Non smoking apartment. For smoking please use the terrace. Children up to 12 years are free except for breakfast. From 12 years, please book as an adult. The vacation apartment has 2 living rooms in the 2. Living room is still an additional single bed. 1 large bedroom with double bed and extra. Single bed, 1 very large kitchen with large dinette. Bathroom with bath and handicapped seat and additionally with shower and toilet and sink. The apartment is 80 sqm in total and very spacious. Like all previous guests, you feel in the newly renovated and beautiful bright apartment every year, certainly immediately very well. In the modern kitchen there are dishwasher, washing machine, cooker u. Fridge. Of course you can also use the washing machine free of charge. All kitchen appliances like cooker, toaster u. Coffee machine are available. In addition, a microwave is available. Crockery, cutlery, cooking pots u. Pans, everything is there for 5 people. There is a nice view from the windows in our flower gardens. You can of course use the covered terrace for breakfast at a large table. As a welcome, you will also receive a complimentary bottle of water and fresh eggs from our free-range chickens. You can of course use the initial bed linen and towels free of charge with us. If the weather should not be so nice, so you can spend a nice time in your holiday home. For this purpose, we provide our guests with a large SONY BRAVIA 4K 55 inches (diagonal approx 152 inches) Full HD - TV with internet connection in the near future fiber optics, available. If you have forgotten your toothbrush or shower gel, we will provide you with the required utensils free of charge. We want you to feel good. For bicycling, fishing, playing football and swimming invites the beautiful surroundings and 2 bikes are of course also borrowed from us for free. Everywhere you will find bike paths and nice places for fishing. We will give you on arrival, tips for cheap and beautiful destinations in the area. Just ask us. For example, the nature reserve Thüle with the Thülsfelder dam, offers a beautiful environment for productive hiking. But activities for the young holidaymakers are also very important at Kletterwald Nord. The animal and amusement park Thüle near Friesoythe is a very well maintained and beautiful amusement park, also very close .. The park has an extension of 17 hectares and is located in the recreation area of the Thülsfelder dam. He is suitable for all ages. Also for all ages the Park of the gardens is suitable. Here you can spend the whole day. There are every few feet free or covered seating and the park is especially for the older guests among you always very popular and you do not expect this great park with Dauergartenschau in our area. It is "Germany's largest model garden complex" in the district Rostrup of the municipality of Bad Zwischenahn and also a stone's throw away from our apartment. The Zwischenahner Meer invites to boating for young and old and also Bad Zwischenahn is worth a shopping spree. You can also get delicious fish sandwiches there. We wish you a wonderful stay with us. in the Beadezimmer are shower and bath. Accessories are: towels, hair dryer, shower cream, soap, Q-tips. A vegetarian breakfast is available for your preparation and is included in the price for 2 persons as not every guest wants sausage or cheese. You would have to get this yourself. From 3. Person costs the single breakfast per person and day only 4, - Euro. Sehr nette Gastgeber. Schöne Wohnung. Alles Tip Top. De woning is heel mooi ingericht zoals op de foto's. Bij aankomst werd alles uitgelegd en info boekjes wat er allemaal in de buurt te doen is, en we kregen al gelijk warme brood, melk, verse eieren van de kippen die ze daar hebben. En elke ochtend werd er ook warme broodjes gebracht, heerlijk om zo verwent te worden. En dan de verhuurders die ook nog heel vriendelijk en aardig zijn dat maakte onze vakantie compleet. De omgeving is ook heel mooi, heel rustig, ideaal voor een wandeling of om te fietsen. Wij zijn er geweest eind december maar we gaan zeker terug, want wil ook zien hoe het daar is in de zomer. Wij hadden het zo fijn dat we niet eens terug naar huis wilde gaan. Heel erg bedankt voor zo'n prettige vakantie. Wir freuen uns, so liebe, saubere und anständige Gäste gehabt zu haben und wir freuen uns sehr, wenn Sie uns wieder besuchen kommen. Es ist ein sehr freundschaftlicher und herzlicher Kontakt entstanden. Alles Gute von uns an unsere Feriengäste. Ach ja, Ihr habt so glauben wir, ein kleines Kuscheltierchen vergessen. Es wartet auf Euch beim Wiederkommen. 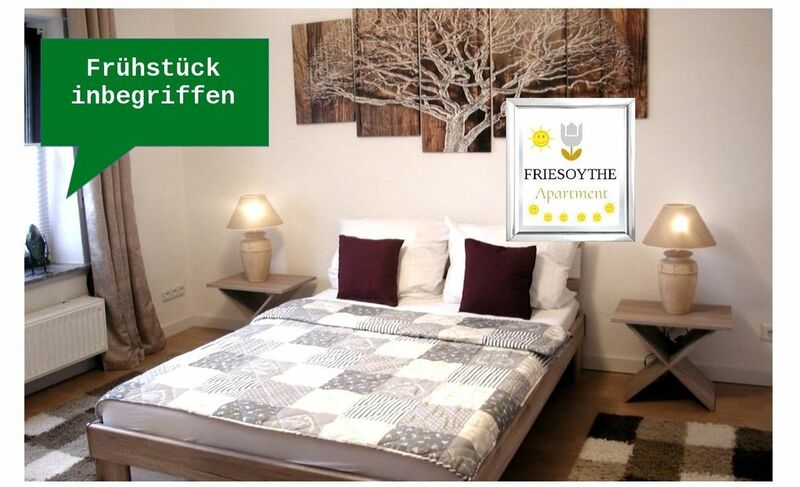 Sehr schöne eingerichtete Ferienwohnung die keine wünsche offen lässt. Die Vermieter sind sehr nett und stets um das Wohl der Mieter besorgt.Super klasse waren die frischen Eier von den eigenen Hühnern. Wir scheinen als Vermieter Glück zu haben, denn wir haben wieder einmal total liebe und nette Gäste kennen lernen dürfen. Wir würden uns sehr freuen Sie wieder zu sehen, dies schreiben wir nicht des Geldes wegen, sondern weil Sie sauber, nett und freundlich waren. Freunde können nicht besser sein. Alles Gute auch Euch, wenn Ihr es lest.